A family are inconsolable after a wildlife warden came onto their land and shot their pet deer five times. A warden, flanked by two colleagues, entered the Mcgaugheys’ Kansas farm and killed the deer, called Faline, apparently just 10 minutes after handing them a warning notice stating the animal was an illegal pet. The family had looked after Faline, named after the Disney Bambi character, ever since it followed Kim Mcgaughey home. “I couldn’t believe it,” said Kim’s daughter Taryn, speaking to The Independent. “One shot to the head would have been enough but then he shot her in the leg and four times in the back. The family started feeding Faline two years ago, when she came in with a broken leg and then refused to leave. 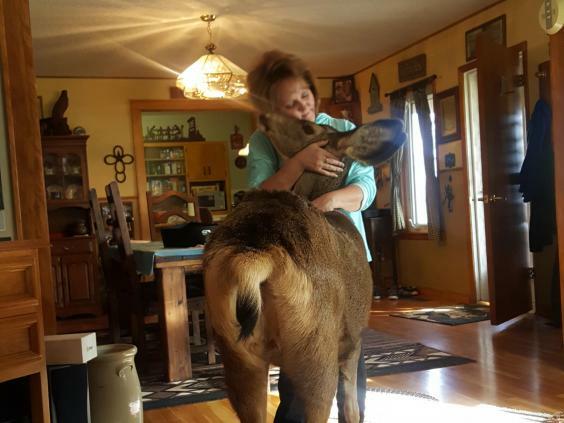 The three-year-old deer apparently hated the wind, would lock the front door using her head and would often sleep in Kim Mcgaughey’s room. “She would get on the bed and stand like she owned the place,” said Taryn Mcgaughey, a fashion, fitness and glamour model. “But she had free rein to do whatever the heck she wanted. She said she believed game wardens got wind of Faline’s domestic existence after she went missing for a week, and the family posted about it on social media. It is illegal in the state of Kansas to keep a wild animal as a pet, and in mid-December the wardens arrived at the family's gate and killed Faline. According to Mark Rankin, law enforcement assistant director for the Kansas Department of Wildlife, Parks and Tourism, the three men had determined it would not be safe to capture the deer. Mr Rankin told journalists there was also concern that the animal could be carrying chronic wasting disease, a fatal illness that cannot be tested for in live deer. Taryn Mcgaughey said she thought the wardens were linked to the Kansas Department of Wildlife & Parks in Dodge City. Department secretary Robin Jennison said he would like the agency to re-examine its policy on euthanising wildlife, although he was confident the game wardens acted within their authority. "All of our people have a real heart for wildlife," he said. "I can't imagine any of our employees enjoying something like this." Taryn Mcgaughey said owners were supposed to be given 30 days to contest a penalty notice over an unlicensed pet and a further 10 days to get a licence. The 34-year-old said she would like the warden to lose his job and for a complete change in wildlife legislation. “My son broke down to his knees when he found out she was dead,” she said.